← Thank You Monsieur Monet! 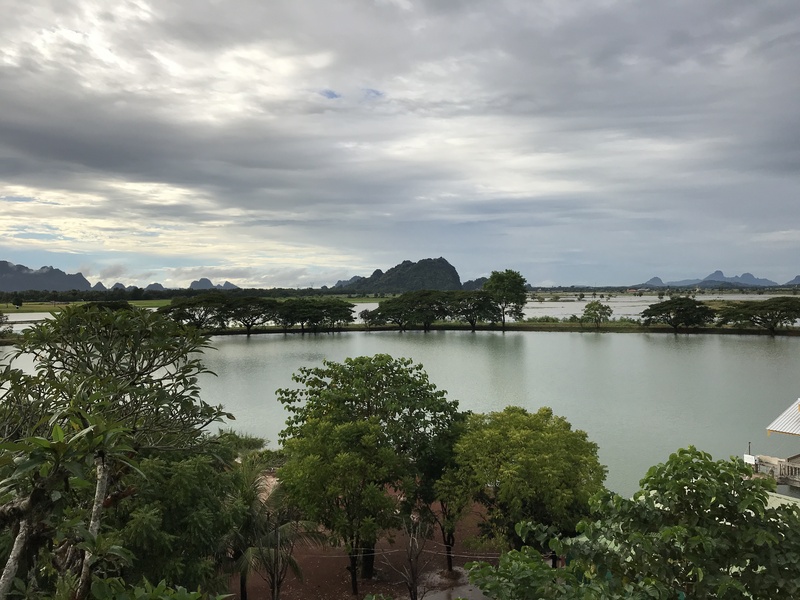 Last week I had an opportunity to join our seventh grade class on a Week Without Walls (WWW) experience to Hpa-An, an area several ours drive to the east of Yangon. Before going any further with this blog, I want to comment on the overall experience I had. Our faculty was wonderful! I was thoroughly impressed with how cognizant they were of the developmental level of seventh graders and the effort made to understand student needs and appropriately engage students in thinking about the experiences they had. Similarly, I’m convinced these were some of the nicest seventh graders I’ve come across. They were diligent in trying to make sure all were included, in trying new things, and in expressing appreciation for the efforts of others. These WWW experiences really are unique. Several times during the trip I found myself lamenting the fact such things didn’t happen when I was a youngster. The overall benefits seem so powerful and enduring. The second day of the trip found us bicycling as a group through the countryside. In many ways the experience was a bit surreal. A morning rain meant there were puffs of small clouds hovering over royal green rice paddies spread out as far as the eye could see. Occasional buttes poked skyward from the ground in a haphazard fashion, reflecting slivers of sunshine, while atop some of the buttes golden pagodas paid credence to the role of Buddhism in the region. The beauty of it all struck me. Just as impressive though was the level of engagement with the environment. Individual farmers – children, adults, even an elderly woman – toiled in the rice paddies, working by hand to ensure a thriving crop. Wagons pulled by bulls made their way along the muddy roads, cows meandered along the roadside, boys shepherded goats and cattle, and homes made of natural material were spotted across the land. I found this scene to be somehow calming. It seemed natural, in a sense wholesome. Life seemed to be moving along in this remote corner of the world in the same way it had most likely done for centuries. A lifestyle was lived completely dependent on the same tools, traditions, and dependence on the land as it had been for generations. As an outside observer looking in, I was conscious of the fact I was probably witness to the last remnants of living in this manner. Already, indications of progress and change were beginning to seep through. Evidence of plans to widen the road and pave it was everywhere with trees being removed and markers placed. Plastic waste had begun to collect around shrubbery, trees, and other natural collection points. Simultaneously, signs for mobile carriers dotted the roadside to entice the occasional traveler. It was beginning to appear as though the past would be pushed aside to make way for the benefits and pitfalls of progress, and I found myself questioning in my own mind the gains progress brings. This is not the first time I have questioned the tide of progress. In 1992, my wife, Kirstin, and I moved to Romania to teach at the American School of Bucharest (Now the American International School of Bucharest). This was our first overseas experience and we were amazed at the life we observed there. I often said to friends back in the U.S. that each time I stepped off the plane in Bucharest I felt I was stepping through a time tunnel. This was a place where electricity was in short supply, traffic lights were turned off at 5:00 PM and never turned on during weekends due to the lack of traffic, and milk was still delivered in a horse and wagon. Outside of Bucharest, you were more likely to see the highway blocked by a heard of sheep than by traffic. At one point in time, while hiking, we met an old man dressed in handmade leather clothes and boots who told us the last time he had seen a foreigner in the area was when the Nazis were there during World War II. In many ways, life seemed simple there, and we were in awe of what we were fortunate enough to experience. We lived in Bucharest for five years. During this period, there was rapid progress throughout the country. New restaurants opened up, medical care improved, and there was greater access to modern amenities. That said, there was a sense of great loss as well. By the time we left, we no longer had that sense of going through a time tunnel. Many of the types of experiences we had were no longer available. Similarly, the improvements that were most apparent were not necessarily gains for everyone. One time during this period, we had lunch with a Romanian family. I asked them how they felt about the changes since communism. As an American, I anticipated they would appreciate the changes and the progress made by the country. Instead, what I heard was despair. The father told me, in the beginning there was great hope. Everyone believed life would improve. Instead, it improved for some, but for most it got worse. He told me under communism they didn’t have much, but at least they always had enough. Now, he could not provide for his family on a daily basis. He indicated this was true for many others. He believed they had traded away their way of life for an empty dream. This sense of despair was a bit of a shock to my system. Coming to Bucharest, I believed people there would welcome progress with open arms. In my mind, everyone would want what we had. I began to ask more people their thoughts on progress, and often heard a similar sentiment. I also began to pick up on a certain level of resentment toward foreigners, especially Americans. For some, this resentment seemed to stem from a belief somehow certain promises had been made but were left unfulfilled. For others, there was resentment over attempts by other countries to control the flow of progress by making threats around things like MFN status if Romanians didn’t conform to standards imposed by other countries. For most though, there was simply a sense there had been too high a price for progress, that too much of the traditional way of doing things had been given up. In short, they had experienced a loss of cultural identity in the name of progress. Riding my bike on muddy roads around Hpa-An, I experienced a sense of déjà vu. I couldn’t help but feel I’ve been down this road before. It is such a shame in so many ways. While I understand the drive for progress, there is also so much to be gained by maintaining certain aspects of a more traditional way of life. It is interesting. Things like the WWW experience we provide for students are a means of making sure contact is made with that way of life and an effort is made to honor it and appreciate it. That said, I believe we need to somehow make an effort to make sure the pitfalls of progress don’t overpower the gains and in the process lay waste to the magic and beauty of what came before. After meeting 4 headmen, a monk, a traditional Thai boxer, an artisan, and many other Thai people each student group presented their plan. No one suggested staying the same and we discussed the types of progress the world seems to value most. It was a great trip and fostered some wonderful conversations as Qatar was also progressing quickly, with many discussions about what parts of their cultural heritage were most important to preserve. Great blog post. I have heard the comment about communism before (from people who worked in Russia, Bulgaria, Albania) … now living the “before C” part here in Venezuela … the country keeps getting closer every day. Hope you are well. Warm regards from sunny Venezuela.